Very clever use of your dies. Beautiful card! Very pretty and the red, white and blue color scheme is subtle. I am a sucker for butterflies. Hope you have a great week. Beautiful card, Susan! I love how you used the Nestabilities as a mask! And yes, I love butterflies too! You are such an inspiration! This is beautiful, Susan! What a pretty way to use the daisy stamp. Your colour scheme is lovely too. I love how you sponged inside the die-cut, it looks wonderful! And what a fun idea with combining two sentiments from different companies! Thank you so much for sharing your card, Susan! I love the detail the faux stitching adds! 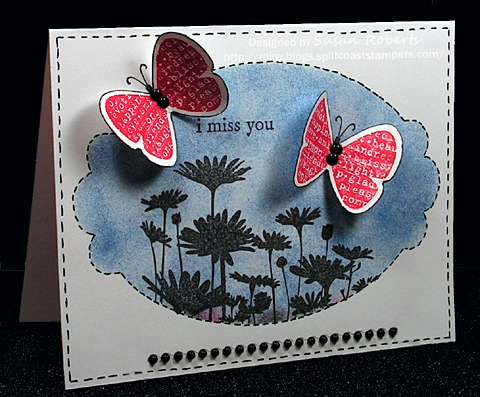 A beautiful and perfect card for OWH! Susan – This is a darling card! I LOVE the use of the die as a mask. And the stitching is the perfect addition. Love the red butterflies too. Guess I better case this one too. Great card for the cause and for the challenge! Cute little butterflies!